This case study covers the journey towards digital transformation for a leading manufacturer of automotive brake parts and accessories. 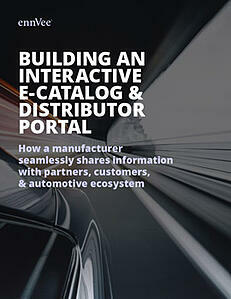 How we designed an interactive digital portal and robust eCatalog that provides exclusive access to all product and technical information. How the eCatalog was awarded the "Automotive Content Professionals Network Award"
The process for building a "Technician Portal" - a social community and learning hub catering to technicians and shop owners, and features instructional content, training course schedules, and loyalty rewards promotions. The process and benefits of implementing a Customer Order Management capability for smart inventory visualization, online price look up, and one-click quoting, ordering, and tracking.